Get a FREE Photo with Santa at Walmart Today (November 3rd) from 1PM to 4PM. Walmart will be is having a FREE Wishlist Event! Come play with this year’s top toys and take a photo with Santa. Featured toys include Pikmi Flip Mi, Croc ’n’ Roll and more. There will be LEGO stickers and Nickelodeon poster giveaways while supplies last! Celebrate the season with special in-store events held on Saturdays throughout the holidays. 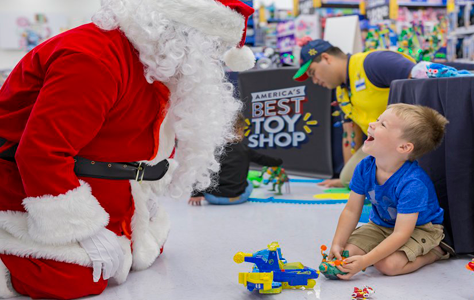 Our America’s Best Toy Shop: Wishlist and America’s Best Toy Shop: Playtime events give kids a chance to test out the hottest toys of 2018, snap a picture with Santa and even take home some free giveaways. The Light Up Your Thanksgiving and Light Up the Party events will provide you with easy tips for hosting memorable holiday parties while you sample some of the season’s tastiest treats. Mark your calendars and enjoy the festivities!